Batik is the iconography of Indonesia. Although found in many other countries on the Indian subcontinent and in Africa, the island of Java can be said to be the place where the most delicate and intricate cloth was produced. It's cultural and economic importance cannot be underestimated. In 2009 UNESCO designated Batik as masterpieces of oral and intangible Heritage of Humanity . Batik cloth was and is used to clothe both men and women and carry babies , although Western dress is now more common in Indonesia, batik is still worn for formal occasions .The fineness of the work was a great status symbol equivalent to the wearing of diamonds in the West, for a good kain or sarong would require many hours of labour . The traditional designs are a mixture symbols of different cultures, for instance the Garuda bird and peacocks of the Hindus, the Arabic calligraphy of the Muslims , the cirebon clouds of the Chinese , and the butterflies of the Japanese. In the 20th century the Dutch colonists had a great influence on this art and introduced chemical dyes and commissioned very fine and beautiful work, revitalising the industry. Batik dates back to the 4 th century BC and has been found in the tombs of Ancient Egypt , it was also known in China . One of the major centres of the batik industry was Jogjakarta, the work was often carried out by the children and grandchildren of the Sultan, with one Sultan having 40 concubines this could mean a large amount of people employed at this. The colours used in batik were natural dyes until the modern era and would vary according to geographic location. Some designs were allowed only to be worn by members or descendants of the Royal family. The colours used in Jodjakarta were indigo blue and brown . A pattern would be drawn upon the cloth in pencil and hot melted wax with a metal tool called a tjanting and would then be applied to everything that was intended to remain white or brown , then the whole cloth was dyed in indigo . The wax was boiled off and the procedure would start again but small dots would be added to the lines and other areas . Everything that was intended to be blue was covered again with wax and everything that was intended to be white was also covered . The areas where a black was required were left open so that the mixture of the brown dye which followed upon the blue created a darker effect . A good batik is judged by the finest of the dots produced with the tjanting not cracks which many people wrongly consider the main feature of batik. More colours of course maybe used, making it a very complicated process. Ann Welch dyed different colours up to 18 times, removing the wax half way through the process . Western batik artists, when using complementary colours paint on the dye but in Ann's fabric they are always dyed in the cloth. Ann learnt batik from the family of the grandson of the Sultan of Jodjakarta and worked with him and his family for two summers. There is a division of labour in the production of batik , the women doing the tjanting work and the men the dyeing and usually the drawing of the pattern. Natural indigo is a poisonous substance so to protect pregnant women men traditionally did the dyeing. Ann's work was first sold at Berkeley Crafts Cooperative , California . She was a member of The Show of Hands the longest running crafts cooperative in New York City. 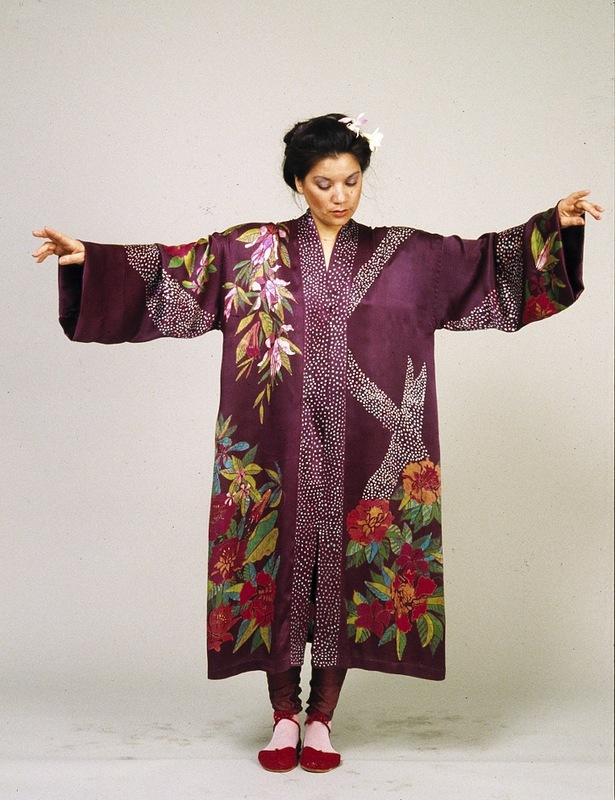 She has had numerous shows of batik in New York where she showed at Verbena galleries and Julie's Artisans Gallery , the Gayle Wilson Gallery, Southampton, Snug Harbor, Staten Island , Clay and Fibre in Taos, and shows in Denver , Santa Fe , Chicago and the Bellevue Arts Museum in Seattle to name a few. Her batik' Bird Market ' was chosen for the cover of FiberArts Magazine which published her work in four books. A chapter is devoted to her work in Alice Sprizens book ' Crafts'. Ann has taught batik at 'Panache' in Denver, her home in Brooklyn New York and has given talks on the art of batik to students at the College of Staten Island and also in Kodikanal Tamil Nadu, India. Ann has sold numerous fabric designs employing the batik method. Ann's work in batik is widely collected. Her patrons include the batik collector Jacques Gadbois, the author Andre Spears, the late sculptor Benson Selzer, the writer Barbara Jacksier, and Drs. Eric and Lori Greenleaf.